These Saints lived during the reign of Emperor Claudius (268-270), when Vicarius who is also known as Vulpius Romulus was governor. Saint Censorinus was the leader of the senate council and a magistrate by office. He was denounced as a Christian and while interrogated he boldly confessed Christ. For this he was imprisoned. Because he worked many miracles, and even raised a dead man, all the soldiers who were present believed in Christ. All of them were beheaded, numbering twenty. 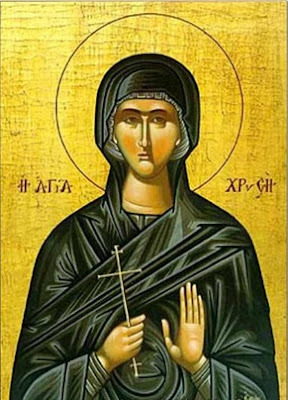 Blessed Chryse was distinguished by her family background and piety, and she was a Christian. She was suspended from a great height, and her sides were lashed with strips of rawhide. Then she was stretched out on the ground and beaten with thick rods, and her wounds were burnt with lit lamps. After this she was imprisoned. Later she was removed from prison and struck with a rock on her jaw, and with lead balls they crushed her spine. They then hung a rock around her neck and cast her into the depths of the sea, and in this way the blessed one received the crown of martyrdom. Saint Sabainus also confessed Christ, and heavy lead balls were tied around his neck. Then suspended from a wooden pole he was lashed with strips of rawhide, and his inward parts were burnt with lit lamps. In the midst of these torments, he thanked the Lord, and delivered his soul into His hands. 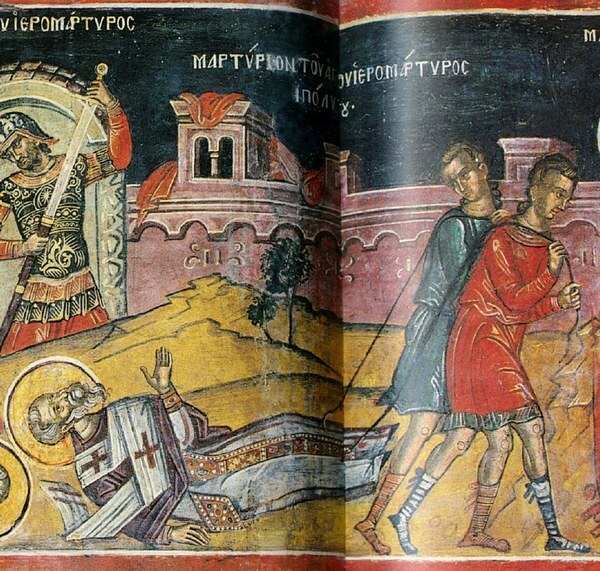 When Saint Hippolytus, Pope of Rome, heard of these martyrdoms, he was moved by divine zeal, and went to rebuke the governor. 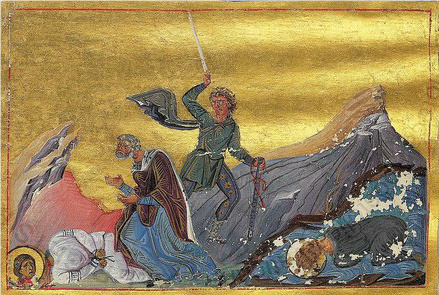 This enraged the governor, so he ordered for the Saint to be struck in the face with slaps. And after the blessed one endured various torments, along with other Presbyters and Deacons with him,** they were all tied together hand and foot, and they were cast into the depths of the sea. In this way the renowned ones received unfading crowns of martyrdom. * This Saint Hippolytus has been the source of much confusion among hagiographers. It is believed that on this day, January 30th, a martyr named Hippolytus of Antioch, who was a repentant Novatian presbyter, was originally celebrated. However, no such martyr seems to have ever existed, and he is not mentioned in any synaxaria. 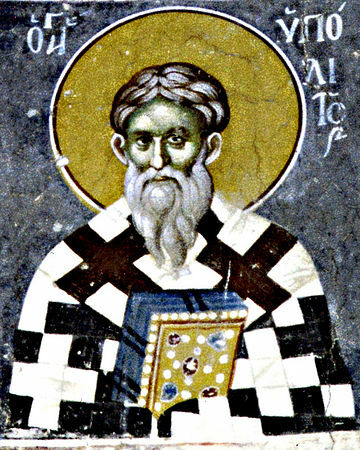 In the Synaxarion of Constantinople, translated above, Saint Hippolytus is called the Pope of Rome, however no such Pope existed. Rather, he could have been the Bishop of Portus, which was an ancient harbor of Rome. Many also associate this Bishop with Hippolytus the Presbyter of Rome (170–235), who was the most important third century theologian of the Christian Church in Rome. This Hippolytus advocated an excessive rigorism, and he seems to have allowed himself to be elected as a rival Bishop of Rome, and continued to attack Pope Urban I (222–230) and Pope Pontian (230–235). G. Salmon suggests that Hippolytus was the leader of the Greek-speaking Christians of Rome. How these other Bishops are associated with the Hippolytus commemorated today is unknown. Perhaps he was the Bishop of Portus and had no association between Hippolytus the Presbyter of Rome, or perhaps he was the rival Bishop of Rome that is also said to have died a martyr after being reconciled with the Pope of Rome, and is most known today for his theological writings. ** The names of these are Auras (Ares), Felix, Maximus, Herculianus (Hercules), Venerius, Styracius, Menas, Commodus, Hermes, Maurus, Eusebius, Rusticus, Monagrius, Amandinus, Olympius, Cyprus, Theodore the Tribune, Maximus the Presbyter, Archelaus the Deacon, and Cyriacus the Bishop.